If you see any job ads on the newspaper offering full-time or part-time employment for the US Postal Service (with a 1-800 phone number to contact), be warned, this may be a scam. If you call the number on the ad, a scammer pretending to be someone from USPS will tell you that you have to pay money to receive more information about the position but will not be offered any postal jobs. These scam artists will offer you various services they claim will help you pass a required USPS pre-employment exam or guarantee that you will be placed on a registry of applicants where new hires will be selected, however, there are no such guarantees. 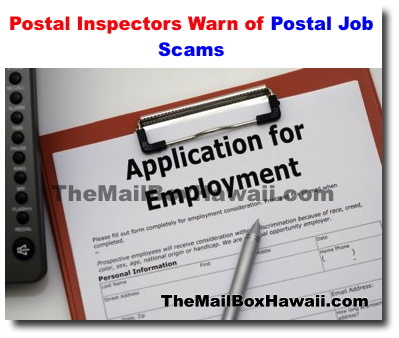 To learn more about other Employment scams, visit the US Postal Inspection Service website.